Founded in 1981, FLO~PRO Performance Exhaust has been manufacturing and distributing only the most durable quality muffler and diesel truck performance exhaust systems for your Ford Powerstroke, Dodge Cummins and GMC Duramax Diesel Truck. FLO~PRO has proven it beats the competition with louvered pipe that accelerates the exhaust flow through our mufflers. FLO~PRO performance mufflers are designed to boost the horsepower generated from your diesel engine. The 100% aluminized steel and stainless diesel exhaust systems, welded construction will outlast conventional locked-seam, double wrap mufflers. The louvers also give a deep performance sound without the use of fiberglass that would eventually blow out! FloPro's aluminized 3" pipe kit includes the pipes required when removing the CAT and DPF system on your 2014-2018 Dodge 1500 EcoDiesel 3.0L. Their contour bent hanger allows them to weld more of the hanger's surface area to the pipe for prolonged durability. 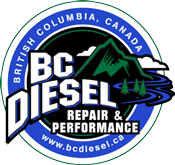 2014-2018 Dodge Ram 1500 Cummins - Includes T409 Stainless Steel pipes to support removal of the CAT and DPF system on your EcoDiesel 3.0L. 2018-2019 Ford 3.0L Powerstroke F-150 - FloPro's aluminized 3.5" pipe kit includes the pipes required when removing the CAT and DPF system and includes a 3.0-3.5" down pipe. Retains OEM muffler and tailpipe. FloPro's 4" Cat & DPF Delete Pipe Kit (Part 1) for 2011-2012 Dodge 6.7L Cummins 3500/4500/5500 (CAB & CHASSIS vehicles). Race Tuning is required with this kit for the truck to function properly. FloPro's 4" Cat & DPF Delete Kit (Part 1 of 2) for 2011-2012 Dodge 6.7L Cummins 3500/4500/5500 (CAB & CHASSIS vehicles). This kit includes a muffler. Race Tuning is required with this kit for the truck to function properly. FloPro's 4" Aluminized Cat & DPF Delete Pipe kit for 2007.5-2010 Dodge Cummins 6.7L CAB & CHASSIS vehicles. Race tuning is required to be installed prior to installation. FloPro's 4" Aluminized Cat Delete pipe kit for your 2007.5-2012 Dodge Cummins 6.7L pickup or cab & chassis - eliminates the down pipe catalytic convertor. 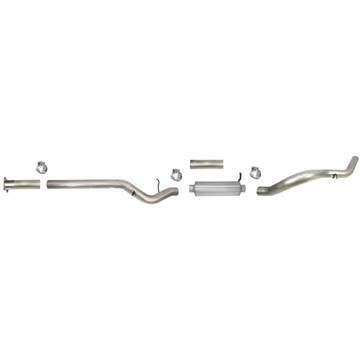 Replace the rusty OEM exhaust from the rear of the catalytic converter to the tail with this 4" aluminized steel cat-back exhaust kit from FloPro for your 2004.5-2007 Dodge Cummins 5.9L HO600 EC-QC/SB-LB-Dually, MC/SB diesel truck. FloPro's 4" Aluminized Cat-Back Exhaust for your 2001 - 2005 GMC/Chevy Duramax 6.6L LB7 / LLY - With Muffler, No Tip. This exhaust system is for trucks with an OEM 4 Bolt Flange coming off of the catalytic convertor. 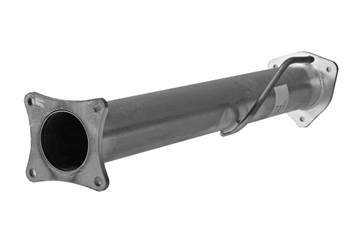 This 4" aluminized DPF delete pipe from FloPro is used when you are removing the Diesel Particulate Filter (DPF) System from the exhaust system of your 2007.5-2012 Dodge Cummins 6.7L. Race tuning required. 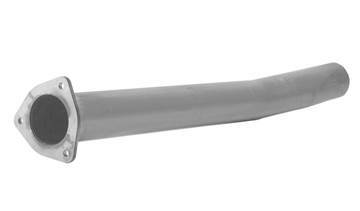 This 4" T409-Stainless Steel DPF delete pipe from FloPro is used when you are removing the Diesel Particulate Filter (DPF) System from the exhaust system of your 2007.5-2012 Dodge Cummins 6.7L. Race tuning required. This pipe kit will remove the DPF system from your 2013 - 2018 Dodge 6.7L Cummins Cab & Chassis vehicle. This pipe kit does NOT include a muffler. See notes inside for details. 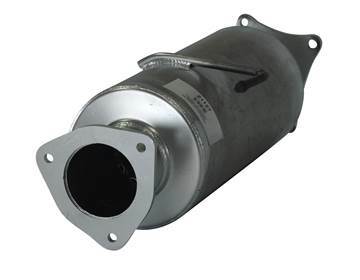 This heavy duty aluminized baffle style muffler from FloPro fits all 4" exhaust systems. It mesasures 8" round, 30" length (37" overall) and 4" inlet/outlets. A replacement muffler delete pipe for 2003-2004 and 2013-2018 Dodge Cummins trucks. If you have a muffler currently in your truck (with 4" aftermarket FloPro exhaust) and want to delete it, or, just require a replacement, then this is the pipe for you! A stainless steel replacement muffler delete pipe for 2003-2004 and 2013-2018 Dodge Cummins trucks. If you have a muffler currently in your truck (with 4" aftermarket FloPro exhaust) and want to delete it, or, just require a replacement, then this is the pipe for you!